I'm taking orders for the panoramic photo I took at Duffus Castle. If you would like a 12 x 20 print, please email me at "davidduffus@greenvillenc.com". $20.00 US for prints, mailing tube and postage. 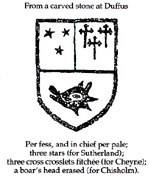 Click on image for updated page for Duffus Crests!! 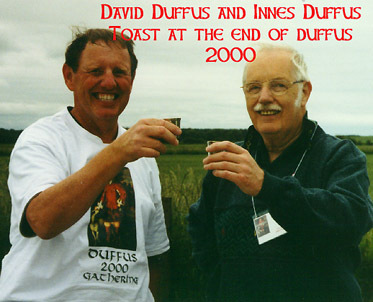 Lynn Duffus' Shortstory - "Peggy"
A photo of author Lynn Duffus at Duffus 2000. To read Lynn Duffus' short story "Peggy"
Click on photo to read obituary!! moved to Pipestone, Minnesota about 1890. I was born there June 26, 1910. I've visited Duffus Castle and Scotland." 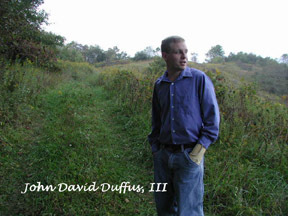 Mr. Duffus will be added to the Benefactors Philantrophists page. For Innes Duffus photos click here!! Click on photo for party!! THE LAST day of the 20th century came to London like rolling thunder, a million pounds and tons of pyrotechnics, an astonishing explosion of sound and a cascade of colour. Fireworks erupted all over the capital, lighting up the night sky as they soared above the river in never-ending ribbons of flames in gold, silver, red, blue and green, streaming into the clouds. Among the thousands of spectators, the reaction was one of awe. They toasted each other, hugged each other and then sang "Auld Lang Syne". Before the stroke of midnight there had been a steady hum of expectation and excitement which grew and grew until came the grand finale. Then the cheers were drowned as endless fireworks burst into the air. Before the display the skies over the river had been lit up by lasers much the way, some of the older people there remembered, as during the Battle of Britain. And, before the whole place seemed to shake at midnight with the first salvo of rockets, there was already the sporadic sound of fireworks let off by the revellers. The sound of instruments from the various concert venues on both banks of the Thames built up the momentum. There was a palpable fervour about the place, with the crowd pressing against each other, swaying in one large mass, and policemen rushing around trying to create order out of a situation rapidly in danger of going out of control. More than two million revellers poured into the centre of London, forcing police to close Blackfriars and Waterloo bridges to traffic because of the numbers thronging the banks of the Thames. By 9pm police also had to close Embankment station due to "sheer volume of people" and they sealed off the nearby roads leading to the river. Sightseers in Trafalgar Square were told they should go to Tower Bridge to see the fireworks. Judy Ireland, from Poole, Dorset, said: "I do want to see the fireworks, so we are going to try to get round to the south side of the river. I've certainly been frightened by the crowds, but it's a spectacular event." In Whitehall people sat on railings and windowsills and even climbed on to the top of traffic lights in order to have a view of Big Ben and the midnight pyrotechnics. Along Westminster Bridge crowds were defending their vantage points, and the pressure of numbers led to standstills in the crowds. On the riverbanks, people were crammed into every available space, and the noise of revellers blowing whistles, cheering and shouting, added to the sense of chaotic excitement. At 9.45pm the Queen was handed the Beacon Millennium Flame to fire the biggest beacon in the world. A huge cheer went up along the bridges as the 25-ton gas burner - the height of two double-decker buses and the width of a tennis court - ignited and sent flames leaping 40 feet into the night sky. Earlier Tony Blair had fired a laser beam across the Thames to launch the London Eye observation wheel, even though it was not yet taking passengers after failing a safety test. As the breathtaking light show and firework display lit up the 450ft wheel, a Concorde carried out a low flypast. Mr Blair wished everyone "a happy and wonderful New Year from all of us here in Britain". He added: "To people throughout the world, we wish you peace, we wish you prosperity in the New Year." The nationwide programme of light shows began at 3.45pm, when a beacon on the most northerly of the Shetland Islands, Unst, was ignited as the sun went down. A crowd of about 100 cheered the occasion, which took place at the RAF Saxa Vord base and was led by Squadron Leader Andrew Duffus and the chairman of Unst Community Council, Gordon Thomson. Hundreds of other beacons flared into life as darkness descended over the rest of the country. The first English beacon was in the Scilly Isles, two hours later. The idea was for rings of fire to converge on national beacons in Edinburgh, Cardiff, Belfast and London, with the event culminating in the lighting of beacons along the Greenwich Meridian. At midnight, police said events were going "according to plan" in central London, with just five arrests for minor offences of drunkenness. As midnight approached, Guy's and St Thomas's hospitals said the situation was "very calm". Despite a steady drizzle, the crowds had begun to gather in the afternoon in preparation for the festivities. Wave after wave of people poured into the capital for the last day of the 20th century, leading to major congestion along the riverside. Police said that despite plenty of advance warning, private motorists had continued to head towards central London, causing long tailbacks. Some sightseers headed straight for the riverbank to seize places for the concerts and laser shows at the Global Village. Others headed east towards the Tower of London and the Dome. Another vast crowd, with many children, went to the funfair in The Mall in front of Buckingham Palace. The funfair was the first event of the day, starting after 11am, and it was an extraordinary sight. "We have two little boys aged eight and six, and they would not be able to stay up for the midnight celebrations, so this is their millennium bash," said Margaret Prentice, 38. She and her husband Don, 40, had come down from Doncaster. She added: "This is the first time the children have been to London. I've seen the palace before, but I never expected this kind of scene. It's absolutely fantastic." Rick Hudson is standing in a cage in the Fort Worth Zoo, staring a Jamaican iguana right in the eye. The iguana stares back with reptilian calm and affection, almost as if aware that this is the man who has brought his species back from the edge of extinction. "I think of myself as a catalyst," says Hudson, 46, taking a break from his hands-on work with reptiles and amphibians. "I rally support, champion causes and catalyze action." Hudson's affinity for reptiles began during his youth, when he spent his idle time in the hills near his home in Virginia collecting salamanders, turtles, frogs and snakes - and testing the patience of his snake-fearing mother. A boyhood hobby became his profession and passion. Hudson is a nationally recognized herpetologist (one who studies reptiles and amphibians) based at the Fort Worth Zoo, who has been working to save the Jamaican iguana, which has the dubious distinction of being designated the most endangered lizard on Earth. Although Hudson is engaged in preserving life forms that humans have helped drive to near-extinction, there is still a boyish enthusiasm in his manner and a sparkle in his eyes when he talks about animal conservation. 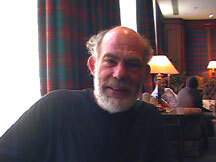 "Any time you take a component out of the ecosystem, you don't know what the consequences will be," he says, adding that the Jamaican iguanas were dispersers of seed, and the rapidly disappearing Asian turtles - another of his projects - are already missed for their role as scavengers in areas where they have disappeared. But, he adds, it's more than just a practical issue. "It's a moral issue," he says. "We're in a rapid extinction process. These species are here for a reason, and man doesn't have the right to cause the extinction of another species. And we have the resources to stop these extinctions." Hudson's obsession for the reptile is well-known to his co- workers in Fort Worth and in the national zoological community. "You can't help catching his passion for the project," says Fort Worth Zoo Executive Director Gregg Hudson, who is not related to Rick. "He's always preaching for the program." "His work is undoubtedly one of the most significant programs of the AZA [American Zoo and Aquarium Association]. He was there at the beginning of the project. We have the resources here in Fort Worth to be able to make a difference. There's a committee of us here who examine and question very closely where we spend our money." Hudson - a graduate of Blue Ridge Community College and the University of Richmond - achieved his boyhood dream of working in a zoo when he came to Fort Worth as assistant reptile curator in 1980. He had previously had an internship at the Baltimore Zoo. With zoo support, he became involved in efforts to preserve certain crocodilians by breeding them in captivity. But it wasn't until 1993 that Hudson developed his interest in iguanas, first working with an endangered species in the British Virgin Islands. He soon focused on the Jamaican iguana and the special problems of preserving a species on a large island with a vulnerable environment. Unlike some endangered animals, Jamaican iguanas, which as adults measure about 4 feet from tip of tail to tip of nose, respond well to efforts at revival. "You can go in and save these iguanas with minimal resources," Hudson says. The near-extinction of the Jamaican iguana, one of 16 species and subspecies of iguanas in the West Indies, came about through the introduction of the Asian mongoose, a small carnivorous mammal brought to Jamaica to control cane rats in the 1870s. This proved to be a huge mistake: The rats are nocturnal, the mongooses diurnal (active in the daytime), and they hardly ever met up with each other. And, as is often the case, the introduction of a foreign species gravely undermined the ecosystem. The mongoose turned out to be a severe problem for native wildlife in Jamaica, particularly for iguanas, which, during the first five years or so of their 35- to 40-year lifespan, are regarded by the mongoose as easy prey and a tasty meal. In the 1940s, the Jamaican iguana was declared extinct, and none were identified by a human being for several decades. In 1990, however, a dog belonging to pig hunter Edwin Duffus chased an iguana into a hollow log. Duffus fortunately recognized the value of the animal, and reported his find to zoologists in Jamaica. According to Hudson, Duffus became "a pig hunter turned conservationist." Duffus now works to persuade the local charcoal burners, who destroy iguana habitat by burning timber to produce charcoal for sale as fuel, to stay out of an area set aside as an iguana preserve. "A successful conservation effort has to have a local population that cares," Hudson says. "We have motivated, caring people in Jamaica." Hudson travels to Jamaica frequently for hands-on work in the program, often camping in the wooded Hellshire Hills south and west of Kingston. Because young iguanas are most vulnerable to the mongoose, Hunter and his colleagues use what he calls a "head-start" program, nurturing iguanas that are taken from nests as hatchlings, then turned loose around the age of 5. They are monitored with smartly designed radio transmitters on their backs, carried in specially made backpacks courtesy of Nike Corp. The wild iguanas that don't have backpacks apparently don't have any aversion to interacting with the fashionably outfitted, previously captive iguanas. According to Hunter, iguanas raised in early captivity are "hardwired" - that is, they take to life in the wild without special training, and mix readily with wild iguanas. In 1998, the program reached a watershed when a "head-start" female produced offspring in the wild. In a more controlled environment, such as a smaller island, there might be a reasonable attempt to eradicate the predatory mongoose. On a larger island such as Jamaica, Hudson can't completely eliminate the mongoose, but can encourage control of mongooses, as well as the charcoal burners, within the designated wild area where the iguana is being re-established. And, on Great Goat Island off the southeast coast of Jamaica, Hudson and his colleagues have established an area free of the mongoose, thus enhancing the Jamaican iguana's chance for survival. The Fort Worth Zoo pays Hudson's salary and the salary of some support staff while he works on the project, even when he is in Jamaica. But it is not a costly project, which makes a difference. "As a nonprofit organization, we have to be aware of the results of spending our dollars," Gregg Hudson says. "With this project, we see tangible results." Michael Hutchins, director of conservation and science at the American Zoo and Aquarium Association headquarters in Silver Spring, Md., says Hudson has "been tenacious in saving the Jamaican iguana. Rick led the pack." Hutchins adds that Hudson's work is something that Fort Worth can be proud of - and has an obligation to support. "The Fort Worth Zoo displays wild animals, and has a moral obligation to contribute to the conservation of these species," he says. "Zoos have an incredibly important role in conservation today, including actively preserving endangered species." Although the Jamaican iguana is Hudson's primary focus right now, he's also involved in trying to save the Asian turtle, although the outlook is less promising. Prized for food and medicinal purposes, the many varieties and subspecies of that animal are being threatened by market demands in China. The Fort Worth Zoo will host an Asian Turtle Workshop in January to propagate the turtle and exchange ideas for preserving it in captivity - at zoos, abandoned hatcheries and, in this case, with private individuals who can provide an appropriate environment for the turtles. Hudson will be at the forefront of that movement as well. "The people of Fort Worth can be very proud," Hutchins says. "Your program at the Fort Worth Zoo has global significance." I've got a few more to add including a letter that I'm searching for!! It has hundreds of old photos that my family and other visitors have uploaded. Feedback is appreciated! Sorry I haven't been in touch for some time, but there has been nothing much happening in my young life recently. However whilst going through the Bonnetmakers Lockit Book today I have found an entry which may be on interest to you. On 25th September 1985, a William T. Creasman, Physician, whose address is given as Durham, North Carolina was admitted to the Craft. He was entered by right of being the son of a member. I'm not sure how close that is to you (ignorant soul that I am) I have been trying to contact Barry Duffus in Australia through his daughter, Maggie Wareing but their address is incorrect. I have it as maggie@midcoast.com.au Is that correct? Have sent you off some photographs for your own collection. I suddenly realised that you may not have many of yourself, to say nothing of Diane and Megan. marry any available Duffus just to be able to attend the next one!!! Johnnie was telling me about the Look-a-Like contest and that she found someone that looks like her grandson. She said you may have a photo, so I promised her I would e-mail you and ask if you do. I am looking forward to reading her diary after it finishes the rounds of her family - she writes a wonderful story and I can't wait to really get into all the details of the event. You are probably descended from a Thomas Duffus who started a plantation in Jamaica in the 1700's. It's likely that had children with one or more of his slaves. Please visit the URL's I have listed for more information. I will add your name to my email list of Duffuses. If you have any photos of your family or your family tree you would like to add to the Duffus web site, please feel free to send them to me at P.O. Box 5026, Greenville, NC 27858. > hello my name is Kediesh Duffus, i live in maryland but i was born in Jamaica. We have just got back to our home in Spain and found your e-mail waiting for us with our ISP when we reinstated our account. I just wanted to thank you for the work you clearly put in to translate it my descendancy chart into the format which now appears. Thank you also for making our trip to Duffus so enjoyable. We all enjoyed the occasion enormously. Dear David- yes, there is a letter on the way but having been in the pub tonight I go digging about the web- I entered something to my mind daft- Glensaugh- lots of it ( a real surprise!) but no chance as far as I could see to reply- anyway, if you've not found it have a wee look- still, I thought there might be space to mention Auld McGreegor the bootmaker or Bob Gauld the blacksmith but (& I am totally new to all this stuff) apparently not. You'll find references to a sheep research station up there- I knew a lad years ago who had worked there & went off to work for the RSPCA- he had the odd story about shepherds up there. But that's his stories. From this(if it all works) you will now guess that I have a modem- yes, all to do with that motorcycle. You've probably got roughly who this is by now- as far as I know the e- mail will tell you. Anyway, letter and a book or two to follow. G'night as Alastair Cooke would say- he was shall we say rather thoughtful tonight. Enough- too right- no mystery which I find the web full of (yes I know that's dreadful English) I can still see you in the Sheraton with your hand out- how the devil you knew it was yours truly I have no idea at all!